I tweeted recently about the heavy use of fumigant fungicides on the Californian strawberry crop. There is a lot going on behind that bland statement: “wash all fruit before eating”, particularly naivety and misplaced trust. I had thought that what I said was entirely reasonable and not really open to question, but I find myself being continually pulled up by the fact that many things which I think are pretty obvious instead actually serve to inflame a large proportion of people. I try not to live in a cognitive bubble but, unfortunately, it’s difficult not to reach the depressing conclusion that this is actually what the majority of people think – nature was OK in pre-scientific days, but man, with his wonderful grasp of science and technology, can always better nature. And this will always be for the ultimate benefit of humanity. The most commonly used fungicide on these 40,000 acres of strawberry plantations (which produce more than 80% of the USA’s crop) is chloropicrin. This chemical is described as a “broad-spectrum antimicrobial, fungicide, herbicide, insecticide, and nematicide”. Apparently, chloropicrin was manufactured by Germany during WWI as a poison gas (ie a chemical weapon), which is severely irritating to the lungs, eyes, and skin. It is injected into the soil prior to planting and will kill just about any pest or fungus in the soil stone dead. It’s also a carcinogen. Returning to what seems blatantly obvious, this doesn’t seem like a particularly safe chemical to be anywhere near food we eat, let alone actually injected into the soil which crops are grown in. Obviously, governments classify chemicals like this as safe to use with various required safeguards, but food safety agencies always have to balance agricultural production requirements against environmental or human toxicity, on a largely financial basis, and the links between government agencies and the manufacturers of these chemicals are too close for us to take any comfort from designations of supposed safety. We always need to keep firmly in mind that we are dealing here with a global system which is based solely on profit - chemical and pharmaceutical companies need to sell these products to farmers and growers in order to make money. That’s what they do: they manufacture chemicals and they sell them. If they sell less, they make less money. These companies are not charities and they are not in business for the good of mankind, only for the good of their own shareholders and/or owners. There is nothing inherently wrong with making profit. I run a small business myself: if I didn’t make a profit, I wouldn’t be able to pay our rent, or our electricity bill. But capitalism used to be a deal – a company makes money and, in return, it provides a living for its workers. On a local scale, it still mostly works like that. But these are not local-scale companies; they are vast multi-national mega-corporations. They are essentially answerable to nobody: not to you or me; not to governments. The deal has broken down. Its proponents would argue that it was capitalism which created our Western economies; it was capitalism which provided the majority of us in the developed world with what we would recognise as our modern, comparatively comfortable lifestyle. But isn’t it merely common sense to wonder whether the making of profit, as a sole motivation, isn’t a good enough reason to do something? In other words, if a large company, or a Government ‘health’ department, says something – anything – about our health, we would do well to choose scepticism as our default position. And this includes the ‘advice’ that pesticides can be simply “washed” off fruit and vegetables. Taking this advice as something valid, sound and truthful displays a quite breath-taking naivety and an extremely misplaced faith that those in government or big business, who we have willingly allowed to have power over us, really do have our best interests at heart. They want us be ‘useful idiots’, as Lenin is attributed as saying: people behaving as (often unwitting) propagandists for a cause whose goals they are not fully aware of, and who are used cynically by the leaders of that cause. It is our duty to see through the deceit. It is our duty to not be useful to them and to not be idiots for their causes. 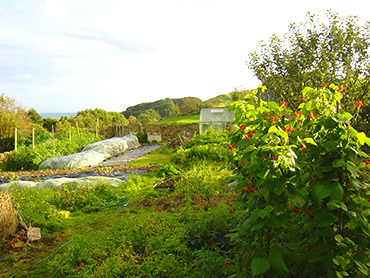 We are pretty much self-sufficient in organically grown vegetables and fruit in our large garden here in Dorset, in southern England. I have been growing here for 23 years, so I have gained a lot of experience, although any gardener will tell you he or she will never know everything, and that each season brings us new experience and new lessons to be learnt. most house plants are very effective at absorbing air-borne pollutants and thereby acting as natural air purifiers: spider plants (chlorophytum), for example, absorb carcinogens like formaldehyde and styrene and decompose benzene and nicotine in tobacco smoke. So the idea that you can somehow get rid of chemicals sprayed on plants by washing them before eating displays a fundamental ignorance of both plant physiology and the realities of supposedly ‘conventional’ agrochemical-reliant farming. Plants are not made out of non-absorbent, inert plastic, but are living, breathing organisms which absorb everything which is in the air, liquid, or soil with which they are in contact. But this notion appears to be sufficiently plausible to be accepted by the majority of people, even though it is, in reality, one of the most blatant and idiotic falsehoods promulgated by the chemical-based food industry – a falsehood that I dearly wish we could somehow confine to the dustbin of history, where it belongs! At its root we are dealing here with a technology-based food production system but, however useful it might appear to be, technology nearly always has serious adverse consequences for ourselves and/or the planet. And I do wonder do we really need even more technology, in order to live a happy, safe, healthy and satisfying life? How many more chemicals do we need sprayed on, or added to, our food, to make it look nicer or last longer? How many more environmental pollutants – and I am including mobile (cell) phone radiation here – should we put up with, as the inevitable cost of making our lives supposedly better? So, fundamentally, I do think that, in general terms, if Nature/God made it, it’s probably OK for us to eat. But if man made it (or tampered with it) it probably isn’t. And my underlying intention with my garden is to work with nature to create and maintain a healthy, productive soil, from which the plants can take exactly what they need, when they need it, on a fundamentally sustainable basis - by which I mean ‘sustainable’ for ever. If the soil I’ve been entrusted with can’t still be used to grow fruit and vegetables in a hundred years, five hundred years, then we’re really just living hand to mouth! 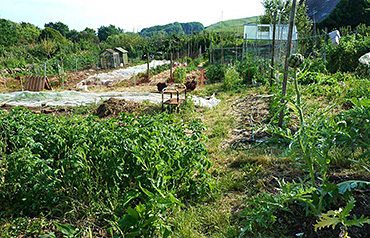 I want someone to be able to come to my garden in the future and be able to grow what they need for themselves and their family just as I am doing now - a permanent and sustainable small-scale agriculture which, of course, is the fundamental philosophical and practical basis on which permaculture is based. Lastly, my Twitter correspondent told me that organic food “doesn’t taste as good”. I will let my tastebuds, and those of our many guests and visitors be the judge of that!